You can Like THE LAST DRAGONEER fan page at Facebook. After surviving her battle with Abaddon, Susah faces even greater challenges. Separated from all she has known, she has to deal with the advanced technology of the Cainites, the presence of myriad fallen angels, eventually coming face to face with the one called Satan. Susah's devotion to duty is shaken when she meets a man unlike any she has ever known. Meanwhile, political upheaval in Sethica threatens to replace the pillars of a free society with a totalitarian oligarchy. All of this happens in the shadow of her father's prophecy of an impending flood. Whatever happens, this out of this world story is sure to wash away some of your preconceptions about the Antediluvian Age. You've never read anything like THE LAST DRAGONEER. Discover for yourself, is this the or a new beginning? Amazing Story - Couldn't put it down. Susah’s story in this third volume goes far beyond where my imagination could have guessed it would go. I don’t want to spoil it for any of you, but suffice it to say that the intensity builds significantly – the demons are more terrible, the Sethicans (humans) sink to new levels of depravity, and we get to explore the secretive Cainite’s culture in much more detail than ever before. I love the way the story kept me guessing, and I found I simply could not put the book down. Every time I thought I knew where things were going, the plot would twist. The way The Chronicles of Susah ties in with the Biblical story of Noah but also contains elements that would only be found in a SciFi novel is amazing. In spite of taking imagination beyond the limit of the average person’s ability to dream, there is no point at which the story contradicts the Biblical account. It’s a fantastic “what if” that has challenged my perspective of the pre-diluvian world. Buy this book. It’s a wonderful culmination of the story, but it’s also a bargain for hours of entertainment and a fascinating excursion into a new way of seeing a very old story. Susah, Princess of the Dragoneers!!!! Susah’s BACK!!!!!! Susah is the ultimate for adventure. In this book, she travels far beyond what she has known…Home. Susah is always fighting battles on the right side, but sometimes even she has real trials and errors and terrors. Susah sees horrors that can only change her mind but not her heart. For a time Susah is held a prisoner and it’s here she learns patience and gains knowledge, but it’s really frustrating to be seen and not heard. She is used to being heard from her high command on earth. She is able to watch and learn who is the enemy and who surprisingly is not. When she gains her freedom, she meets someone who gains her trust and for a while her heart. When she winds up back home, she has been gone so long and so many things have changed and NOT for the good. Earth has become even more evil, sad and pathetic. The only good thing is being reunited with old friends and family. Thinking she and they can still save planet earth, they gather the last dragons and prepare to fight. When the fighting begins and it seems that “good” can’t win, something unbelievable happens that no one, besides her father, is prepared for. With her dragon drawing it’s last breath, who will save her or can she be saved? Take Susah’s journey, travel new and unknown planets and places. In this book Charles Sutherland pulls it all together. You don’t have to wonder who is who, are they good or bad. He has a list at the end of the book that tells you who everyone is and MAPS to show you where it all takes place. TAKE. THE. JOURNEY. 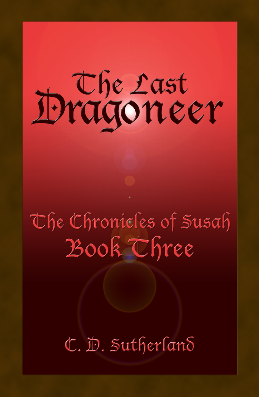 Sutherland delivers a satisfyingly meaty third volume of Susah's adventures with "The Last Dragoneer." Susah's sense of adventure--and her destiny--take her far from home and the familiar where her headstrong ways and fierce loyalty to her Sethican/human roots find new challenges and some hard lessons. The gifted dragoneer meets her match with intelligent and capable counterparts among the Cainites, and then there is the unexpected arrival of the only person that could truly rival her (I can say no more). The previous books introduced the city, Sethica, an island of humanity surrounded by a world increasingly influenced--and polluted--by the demon Abaddon. Here in Book 3, we learn along with Susah just how protected she was, and how little she was allowed to know about the greater reality of her time. The peoples, cultures, and technologies introduced in the first two books expand exponentially here. There's a lot to keep track of, just as we today have much to keep track of as we try to keep up with current events and their meaning within a greater context. This is the beauty of Sutherland's creation, that it allows such rich comparison with our day, enough so that I wonder what greater realities I am not allowed to know about in my own time. I am delighted with the hints that Sutherland sprinkles throughout Susah's adventures, as if daring me to believe yet another possibility.